If you were paying more attention to the hairdo’s than the clothes coming down the runways for the Spring 2013 collections, you probably noticed a lot of side-swept bangs. Fashion Houses, including: Valentino, Louis Vuitton, Chloe, Lanvin, Moschino, Anna Sui and Marc Jacobs all featured their own version of side fringe. Thus, making it the hottest hair trend of the moment. The great thing about the side-swept bang is that it’s easy to create whether you have bangs or not. It’s a fun way to add attitude to any hairstyle and is flattering to all face shapes. If you already have bangs, then you’re in luck! Just blow dry them to the side and you’re good to go! For others the others out there, here are some easy steps to create the hot look. Part your hair slightly to the left or right side, whichever you prefer. Using a paddle brush, brush the front section of your parted hair forward. Sweep the hair to the side, so that it drapes across your forehead, just above your eyebrow. Hold the hair in place by tucking a bobby pin right behind your ear. Finish the look with a light hair spray. 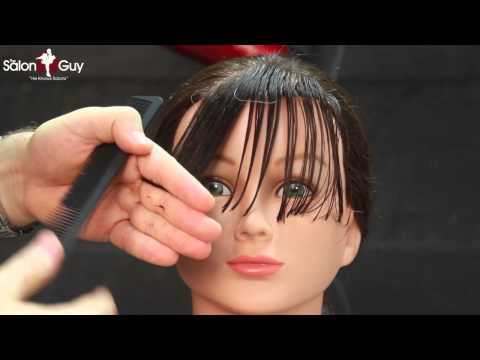 For more tips, you can watch this great tutorial from “The Salon Guy” on Youtube!